TAMPA, Fla. -- Everyone is hoping for better economic headlines in 2011, but if news about the economy flies over your head or makes you anxious because you barely comprehend what it’s all about, a couple of courses that deal with money matters just might help. They’re not for economics and business majors only. You don’t need to become an expert to, at the very least, equip yourself with key terms and concepts. To have a fighting chance in a world of powerful economic forces, it certainly can’t hurt to understand the financial dimensions of your life and how you fit into the big economic picture -- regardless of your profession. “Economics affects every area of life, every area of society,” said University of South Florida Department of Economics Chair Kwabena Gyimah-Brempong. “There is the economics of health care, economics of the environment, economics of developing countries, labor economics, economic history and the history of economic thought. The arts have an economic impact. Even the economics of religion and the economics of politics are being studied. He said there are really only two basic concepts to know -- the two underlying principles of economics -- cost/benefit and incentives. “Everything you do has a cost and a benefit,” he said. “It may or may not be money; it could just as easily be time, energy or whatever. We are all always balancing benefits against the costs. And secondly, incentives matter, whether they are positive or negative incentives. Gyimah-Brempong recommends looking at the study of economics the way one would approach a cookbook. There’s science and art to both cooking and understanding economics. Armed with basic understandings, just about anyone becomes better able to understand microeconomics, the economic analysis of individuals’ daily decisions. Macroeconomics is another matter. It focuses on the behaviors of the entire economy rather than on analyses of individual behavior. “What may work at the individual level might not work for the bigger picture in macroeconomics,” Gyimah-Brempong said. For example, it might be a good thing for individuals to save money, but when everyone saves and no one spends, the economy of a community suffers. “If no one is buying, eventually you can see an economy collapse. The study of basic economics prepares you to understand the basis of rational choice and makes you a better consumer of economic information and better able to understand public policy debates and decision-making,” he said. Economic news consumers have heard much about the complex mathematical models used to create financial instruments and predict or explain economic behavior. The complexity makes many run for the cover of not so blissful ignorance. While the thought of studying economics might seem daunting to some, Gyimah-Brempong wouldn’t do anything else. The study of economics brings with it learning problem solving at a level that can be used in any career, but particularly in business and government. USF students can earn a Bachelor of Arts in Economics through the College of Arts and Sciences or a Bachelor of Science in Economics through the College of Business. There are different course requirements in the two programs. A combined five-year bachelor’s and master’s degree program is open to high achieving students who meet that program’s stringent requirements. The master’s and doctoral programs in economics offer advanced studies that prepare students for careers in academia, business and government. The USF Ph.D. specializes in health economics and other applied areas of microeconomics. 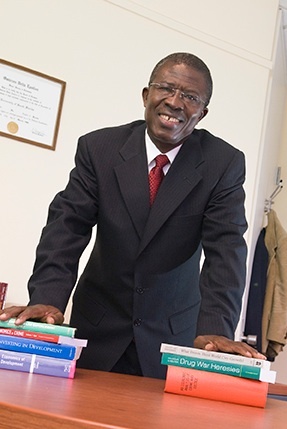 “USF has a very distinguished faculty whose expertise covers health, labor, sports, public economics, urban economics, international economics, industrial organization and development economics,” Gyimah-Brempong said.